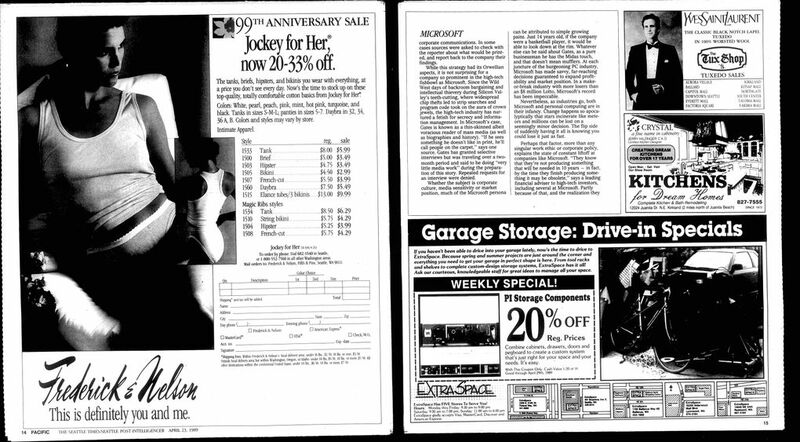 The New York Times' story about Amazon's corporate culture, in some ways, mirrors a piece published by The Seattle Times in 1989. See the archived version. During last fall’s United Way campaign at Microsoft, two vice presidents made a wager on whose division would generate the most contributions. The loser, it was agreed, would have to swim the length of “Lake Bill,” a small artificial lake at the Redmond corporate campus named after Bill Gates, co-founder and chairman of the world’s No. 1 computer software company. When the campaign wrapped up, however, there was disagreement about who had won. One division had pulled in more money, but the other had a higher percentage of giving. Statistically, both were claiming victory. To settle the dispute, it was decided that both had “lost” and would be forced to swim the lake. At noontime on the eventful day, employees crowded around the oversized pond to witness the proceedings. Pranksters, concerned that the lake might be too comfortable despite the 38-degree late-fall chill, threw in chunks of ice to lower its temperature. First up was the colorful Steve Ballmer, vice president for systems software, a great quipster who once called Intel’s 80286 computer chip “brain-damaged” (an in-joke, folks). With dramatic flair, Ballmer slowly stripped down to red bikini shorts, dived in and splashed his way to the other side. Following him was Mike Maples, vice president for applications who had come to Microsoft after 23 years with IBM and conducted a sweeping reorganization credited for improving efficiency and teamwork within the company. Maples removed his suit jacket, watch and shoes, emptied his pockets and, attired in a glistening wetsuit, jumped in amid the hoots, howls and cheers of onlookers. 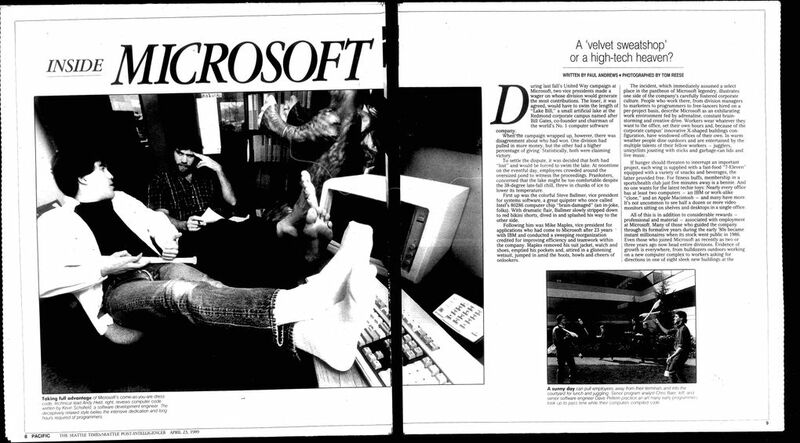 The incident, which immediately assumed a select place in the pantheon of Microsoft legendry, illustrates one side of the company’s carefully fostered corporate culture. People who work there, from division managers to marketers to programmers to free-lancers hired on a per-project basis, describe Microsoft as an exhilarating work environment fed by adrenaline, constant brainstorming and creative drive. Workers wear whatever they want to the office, set their own hours and, because of the corporate campus’ innovative X-shaped buildings configuration, have windowed offices of their own. In warm weather people dine outdoors and are entertained by the multiple talents of their fellow workers – jugglers, unicyclists jousting with sticks and garbage-can lids and live music. If hunger should threaten to interrupt an important project, each wing is supplied with a fast-food “7-Eleven” equipped with a variety of snacks and beverages, the latter provided free. For fitness buffs, membership in a sports/health club just five minutes away is a bennie. And no one wants for the latest techie toys: Nearly every office has at least two computers – an IBM or work-alike ”clone,” and an Apple Macintosh – and many have more. It’s not uncommon to see half a dozen or more video monitors sitting on shelves and desktops in a single office. All of this is in addition to considerable rewards – professional and material – associated with employment at Microsoft. Many of those who guided the company through its formative years during the early ’80s became instant millionaires when its stock went public in 1986. Even those who joined Microsoft as recently as two or three years ago now head entire divisions. Evidence of growth is everywhere, from bulldozers outdoors working on a new computer complex to workers asking for directions in one of eight sleek new buildings at the headquarters complex. The company, with $600 million in sales and $125 million in profits, nearly doubled in size last year to 2,000 workers at the corporate campus and 3,800 worldwide. Although Gates has cautioned that profit margins will narrow because of greater focusing on research and development, which don’t show immediate results on ledger sheets, few analysts see the company reaching a plateau for some time. It is the second part of the equation that casts the only shadow on Microsoft’s corporate landscape. There is a difference between having fun and venting nervous energy, between riding an adrenaline high and running on empty, and insiders say the demanding pace and push of the high-tech fast lane eventually extract a heavy toll on workers’ well-being. The company’s awesome growth – it had just 200 employees as recently as 1983 – has produced an inevitable share of winners and losers, and competitiveness remains high as rising stars jockey for control of corporate fiefdoms. Stock options during the company’s early growth produced numerous wealthy sub-30-year-olds, and for a while buttons showed up on lapels bearing the inscription FYIFV, standing for “F— You, I’m Fully Vested.” Many of those associated with Microsoft’s early success, in fact, have left the company – partly to explore other opportunities, partly because they are financially secure, but also because, they say, Microsoft simply expects too much in human terms from its employees. One former executive has even talked about forming a support group for ”recovering” ex-Microsoft workers. The delicate balance between work and human potential at Microsoft is an issue that extends well beyond one company and its employees. Computers are playing an ever-expanding role as the work force changes to a service- and information-based economy. The presence of video-display terminals in the workplace is expected to more than double – to some 70 million – by the turn of the century. Part of the high-tech work ethic stems from the ”Silicon Valley mentality,” spawned by the birth of the Apple computer a little more than a decade ago in a fabled San Jose, Calif., basement. From the start the slogan was, ”No Limits.” If you thought big and pushed hard enough, you could turn a little box of circuit boards and disk drives into a machine powerful enough to drive the very future of the human race. Not incidentally, you could become rich and famous along the way as well. Today there are virtually thousands of start-up companies around the U.S. and the world dreaming the same dream – including some 650 software ”offspring” of Microsoft in the Puget Sound area, making this region the third-largest in the country behind California’s Silicon Valley and Massachusetts, home of Microsoft’s primary competitor, the Lotus Development Corp. If “techaholism” sounds like the demonic work of invading space aliens in the bucolic Northwest, they are more E.T. than Darth Vader. Partly because companies see themselves as pioneers on the technological landscape, partly because the word “unions” makes the blood drain from their face, they offer an entire supermarket of carrots to workers who in their own right are high-achievement, self-driven personalities. For anyone interested in being on the cutting edge of the industry, Microsoft is high-tech heaven. Another key component of Microsoft’s informality is its seductive E-mail (electronic messaging) system, which Shirley says epitomizes the corporate culture at Microsoft. 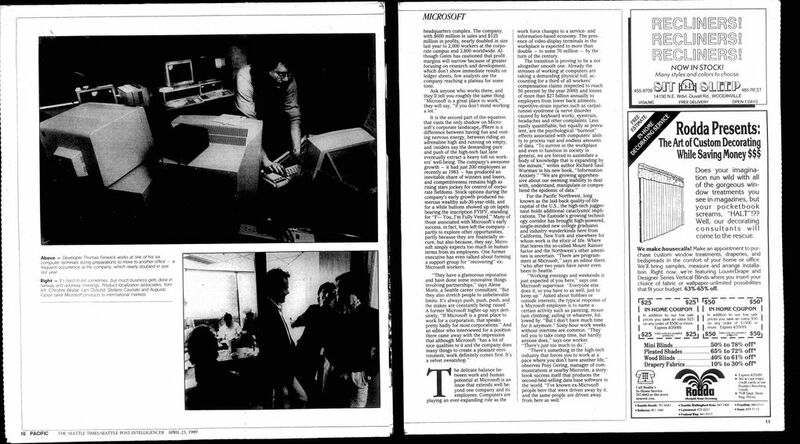 Workers can message each other – even Gates and Shirley – day and night, to and from home or office computers, in an instant communications network that, Shirley notes, “flattens the corporate hierarchy considerably.” The sophisticated system displays a queue showing the time and date and sender’s “log-on,” or nickname, for each message and a brief description of its contents. If there’s a drawback, it comes under the heading of too much of a good thing: Nathan Myhrvold, director of advanced development, typically receives 200 messages a day, and is still plowing through a backup queue of some 1,600 messages left over from a three-week hiatus when his wife had twins in January. The strawberry-blond Neilson, a lightning-tongued college English major from Connecticut who joined the company two years ago after graduate school in marketing, is representative of the somewhat eclectic career path many recruits have followed to Microsoft. A computer hobbyist who formerly worked as an editor for The Paris Review, a leading literary magazine in New York, Neilson decided to turn his avocation into his vocation and vice versa. However much pride Microsoft takes in its workplace innovations and gung-ho atmosphere, the company is considerably less forthcoming about the pressures of breakneck deadlines and constant growth. Workers quick to extol the multiple charms of their employer prefaced all negative comments with a request for anonymity, and even ex-Microsoft employees expressed concern about repercussions, since many still have affiliations with Microsoft or the high-tech industry. Halfway through the research for this article, sources began calling back frantic, demanding to know which parts of their statements would be used – the result of a memo from Shirley requesting that any contacts with outside media be sanctioned first by corporate communications. In some cases sources were asked to check with the reporter about what would be printed, and report back to the company their findings. While this strategy had its Orwellian aspects, it is not surprising for a company so prominent in the high-tech fishbowl as Microsoft. Since the Wild West days of backroom bargaining and intellectual thievery during Silicon Valley’s teeth-cutting, where widespread chip thefts led to strip searches and program code took on the aura of crown jewels, the high-tech industry has nurtured a fetish for secrecy and information management. In Microsoft’s case, Gates is known as a thin-skinned albeit voracious reader of mass media (as well as biographies and history). “If he sees something he doesn’t like in print, he’ll call people on the carpet,” says one source. Gates has granted selective interviews but was traveling over a two-month period and said to be doing “very little media work” during the preparation of this story. Repeated requests for an interview were denied. Whether the subject is corporate culture, media sensitivity or market position, much of the Microsoft persona can be attributed to simple growing pains. Just 14 years old, if the company were a basketball player, it would be able to look down at the rim. Whatever else can be said about Gates, as a pure businessman he has the Midas touch, and that doesn’t mean mufflers. At each juncture of the burgeoning PC industry, Microsoft has made savvy, far-reaching decisions guaranteed to expand profitability and market position. In a make-or-break industry with more losers than an $8 million Lotto, Microsoft’s record has been impeccable. Nevertheless, as industries go, both Microsoft and personal computing are in their infancy. Change happens so apocalyptically that stars incinerate like meteors and millions can be lost on a seemingly minor decision. The flip side of suddenly having it all is knowing you could lose it just as fast. Perhaps that factor, more than any singular work ethic or corporate policy, explains the state of constant liftoff at companies like Microsoft. “They know that they’re not producing something that will be needed in 10 years – in fact, by the time they finish producing something it may be obsolete,” says a leading financial adviser to high-tech investors, including several at Microsoft. Partly because of that, and the realization they may not be able to keep up their current pace forever, they tend to be conservative investors “more comfortable in traditional programs of bonds, CDs and tax-free issues,” the adviser says. If workplace progressivism and corporate philanthropy seem a lot to ask of a youthful industry, they are not ideals inconsistent with Microsoft’s vision of itself. Over and over, comparisons between it and the Northwest’s other leader in American industry – The Boeing Co. – pop up in conversations. Both companies achieved early and prominent success, and both are net exporters. Of all major software companies, Microsoft is in the best position to eventually achieve the kind of hegemony in its field that Boeing enjoys in commercial aircraft. 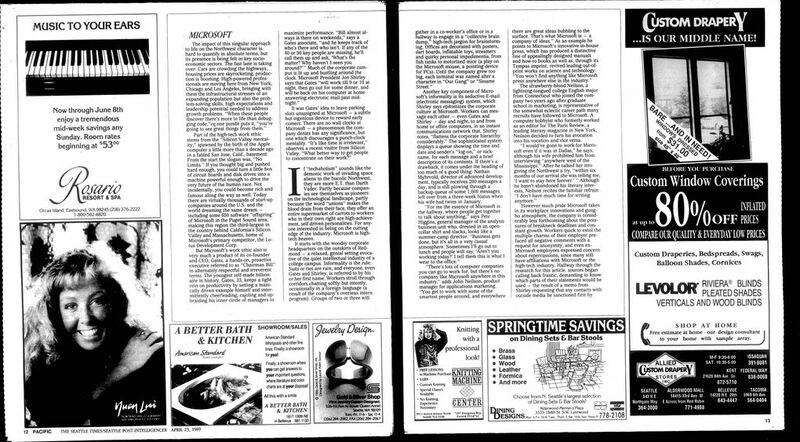 ‘What you have here in the Northwest as we head into the Information Age are the nation’s premier companies at what the U.S. does best – commercial aviation and software,” says Peter Rinearson, a writer and software developer who recently issued an add-on program for Microsoft Word, for which he also wrote a best-selling guide. 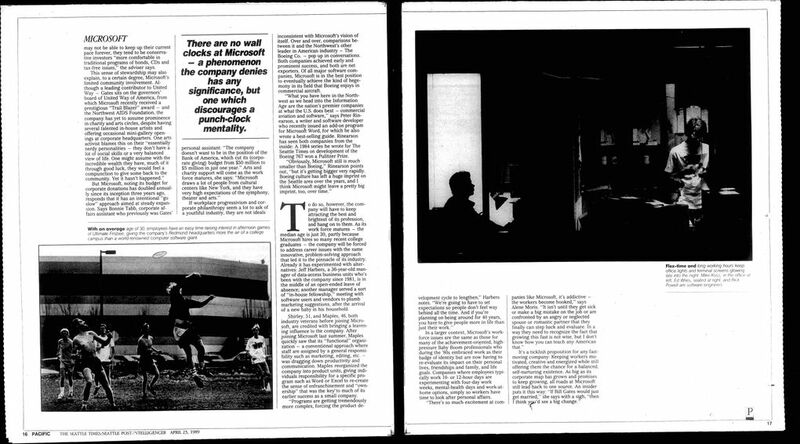 Rinearson has seen both companies from the inside: A 1984 series he wrote for The Seattle Times on development of the Boeing 767 won a Pulitzer Prize. To do so, however, the company will have to keep attracting the best and brightest of its profession, and hang on to them. As its work force matures – the median age is just 30, partly because Microsoft hires so many recent college graduates – the company will be forced to address career issues with the same innovative, problem-solving approach that led it to the pinnacle of its industry. Already it has experimented with alternatives: Jeff Harbers, a 36-year-old manager of data-access business units who’s been with the company since 1981, is in the middle of an open-ended leave of absence; another manager served a sort of “in-house fellowship,” meeting with software users and vendors to plumb marketing suggestions, after the arrival of a new baby in his household. Shirley, 51, and Maples, 46, both industry veterans before joining Microsoft, are credited with bringing a leavening influence to the company. After joining Microsoft last summer, Maples quickly saw that its “functional” organization – a conventional approach where staff are assigned by a general responsibility such as marketing, editing, etc. – was dragging down productivity and communication. Maples reorganized the company into product units, giving individuals responsibility for a specific program such as Word or Excel to re-create the sense of enfranchisement and “ownership” that was the key to much of its earlier success as a small company. In a larger context, Microsoft’s work-force issues are the same as those for many of the achievement-oriented, high-pressure Baby Boom professionals who during the ’80s embraced work as their badge of identity but are now having to re-evaluate its impact on their personal lives, friendships and family, and life goals. Companies where employees typically work 10- or 12-hour days are experimenting with four-day work weeks, mental-health days and work-at-home options, simply so workers have time to look after personal affairs.